In the 2012 presidential election, the American people will have to choose between incumbent President Barack Obama (D) and Mitt Romney (R). With this choice, the American public will determine who sets the tone for national policy and is given power over the executive branch of our government. There are many ways to look at the prospective presidential candidates, but one is to look at their past actions and affiliations in order to predict how they will act in the future; in this article, I will discuss the past actions of both current President Barack Obama and candidate Mitt Romney in relation to the agro-giant Monsanto Corporation. As Obama has already served a term as president, there is little guessing required to predict what he will do in regard to Monsanto if he is given a second term—his actions speak louder than any speeches. A politician may rhetorically support one thing during speaking engagements, but what truly matters are their actual policy choices rather than scripted comments. 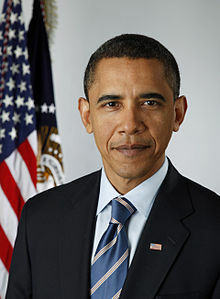 Throughout his first term, President Obama has presided over the passage of several Monsanto-friendly legislative initiatives and has appointed numerous people associated with Monsanto to high-level positions. During Obama’s four years as president, the federal government had several opportunities to pass legislation and executive initiatives which affect Monsanto. Of these federal initiatives, the 2010 African hunger plan and the 2012 Farm Bill present the most important examples of the Obama administration’s friendly attitude towards Monsanto. In 2010, the Obama administration pushed a humanitarian initiative focused upon increasing the food supply of poor areas of Africa—while the ideals of this program are admirable, the execution presents an incredible opportunity to agro-business conglomerates like Monsanto. In order to solve the hunger problem in Africa, the Obama administration has partnered with large industrial farming and GMO operations, under the aegis that these organizations can produce large amounts of food quickly. By giving several billion dollars to agro-businesses, one of which is Monsanto, the “Southern Africa FY 2010 Implementation Plan” intends to promote the expansion of these businesses into the provision of food for Africa. In focusing on promoting industrial, mono-crop farming and genetically modified goods rather than investing in local farms, the Obama administration created a situation where Monsanto is able to increase its profits. As a partner in the Obama administration’s Africa program, Monsanto will be given subsidies to expand into the African farming market. This expansion is aimed at increasing food supplies in Africa, but it will have the unintended consequence of promoting Monsanto’s takeover of the African food markets. Once Monsanto gains a foothold in the African food market—which is likely given the level of subsidies offered by the US government—they will be able to crowd out local farmers and capture the truly massive African food market; Monsanto is able to supply far more crops than any local farmer and at a lower price, thus it will likely reduce the competitiveness of local farmers. This capturing of the African food market by Monsanto means that more food will be available, but it will be supplied by Monsanto rather than small African farms and the local farmers of Africa will gradually begin to go out of business. Put plainly, Monsanto will crowd local African farmers out of the market and will make a profit that would be more beneficial in the hands of local African farmers and in the local African economy. It is clear that Monsanto sees the Africa hunger plan as beneficial to its business, as Hugh Grant—the current Monsanto CEO—said this in response to the Africa initiative: “I’m delighted to be here taking part in this conversation as I believe public and private sector commitment is necessary and able to support a transformation in African agriculture.” The transformation that Grant envisions is one where large-scale industrial farming takes over from smaller, local farms, and provides mass-produced crops. In such a situation, hunger decreases, but it is multi-national corporations rather than local farmers which do this farming and garner most of the profits. On the issue of GMO labeling, Obama is rhetorically supportive of mandating GMO products to be labeled, but his administration has been largely silent on the issue. 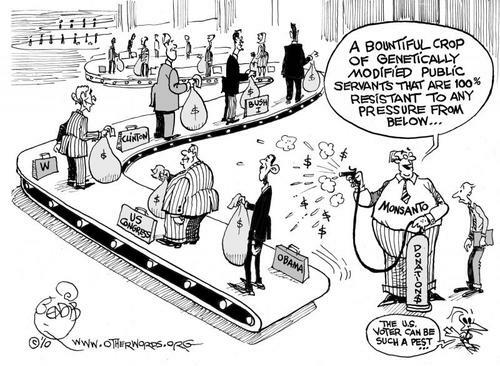 During the creation of the 2012 Farm Bill, there was a fight over mandating that genetically modified foods be labeled. Despite Obama’s supposed support for such labeling, his administration was essentially silent on the issue during this fight and, as a result, no mandate was passed. Currently, there is no federal regulation that ensures that all GMOs are labeled, and there doesn’t appear to be any possibility that such regulation is going to be passed in the immediate future. The aforementioned “Farm Bill” includes several policy changes which are immensely advantageous to Monsanto. While this is an issue that primarily involves the legislature rather than the Obama administration, it bears mentioning that the Obama Administration has been essentially silent on the proposed policy changes and appears unlikely to veto the bill if it passes the legislature. The Farm Bill would be an immense boon to Monsanto, as it would streamline the approval process of its GMO crops and would limit the ability of the federal government to regulate its commerce to the Department of Agriculture. In totality, legislation passed under the Obama administration has been beneficial to large agro-businesses, one of which is Monsanto. Very little has been done to increase regulation on GMO producers and several laws have been passed that directly benefit such corporations. Monsanto is a very large business and has control over a significant amount of the agro-business and genetically modified organism markets. Both the agricultural and GMO markets involve large public safety concerns (ex. food safety), thus Monsanto is heavily affected upon federal regulations (or potential regulations) on its business—the largest of which come from the United States Department of Agriculture [USDA] and the Food and Drug Administration. If regulations and labeling requirements are increased, Monsanto’s profits are directly impacted; conversely, if, such regulations are kept low, then corporations like Monsanto make a larger profit. 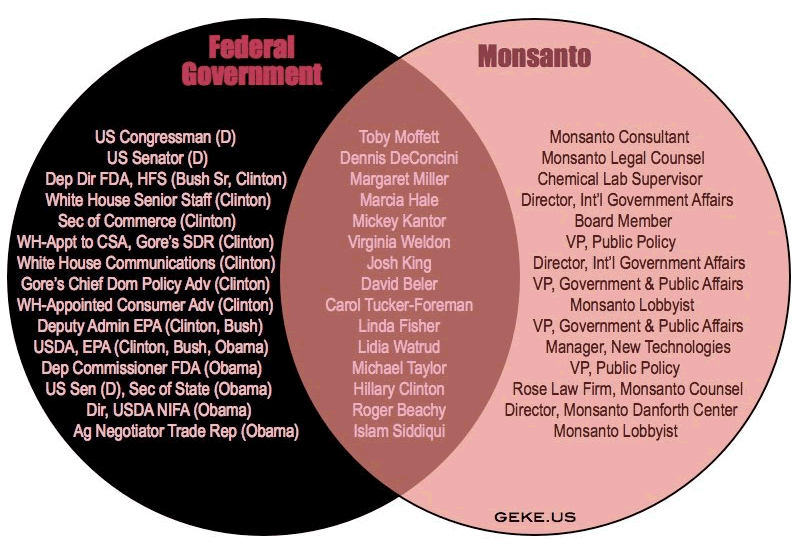 While there are numerous points of overlap between Monsanto and the United States Government under the Obama administration, the three most important connections are that of Michael Taylor, Roger, Beachy, and Islam Siddiqui—all three of these Monsanto affiliates were appointed to high level positions within the government by the Obama administration. The Obama administration appointed Michael Taylor, the previous vice president of Monsanto and a current Monsanto lobbyist, to a high level advisory role at the Food and Drug Administration [FDA]. It is virtually inarguable that this appointment constitutes a massive boon for Monsanto and an undeniable conflict of interest for Taylor. Given the fact that Taylor is a lobbyist for Monsanto and is being paid by the agro-giant, it is reasonable to assume that his advice to the FDA is focused upon helping his employer reduce its regulatory burden and improve its profitability. It isn’t a secret who Taylor worked for and we can assume that the Obama administration knew who they were appointing when they did it. Roger Beachy, the Director of the Danforth Plant Science Center (a Monsanto organization), was appointed by the Obama administration as the Director of the USDA’s National Institute of Food and Agriculture. NIFA is a department of the USDA which focuses on funding research and innovation in the field of agriculture as well developing more efficient ways to produce food. As the major grant-writing division of the USDA, the NIFA department has the ability to grant or reject agricultural research grants. By giving Beachy the Directorship of the NIFA, the Obama administration gave a Monsanto associate the most powerful position in the organization which allocates agricultural research grants. Needless to say, this appointment is a great boon for Monsanto and bad news for any group which disagrees with the agri-business giant. Islam Siddiqui, a Monsanto lobbyist, was appointed to the post of Agriculture Trade Representative by the Obama administration. Trade representative are tasked with promoting trade of goods within their appointed field (ex. Agricultural trade reps promote the export of American crops). As Monsanto has a controlling interest in American corn production, the appointment of a Monsanto lobbyist to the position of trade representative is a large boon for the corporation. Siddiqui’s government job is to promote the export of American crops and his Monsanto job is to promote the sale of Monsanto crops—it is undeniable that these two jobs present a conflict of interest and will only lead to Siddiqui representing Monsanto’s interests as though they are the interests of the United States. The justices that a president appoints to the Supreme Court is one of their most enduring and important contributions to the United States that every president gives the country. During his first term, President Obama appointed two Justices, one of whom was Elena Kagan, the former Solicitor General of the United States. During her time as the Solicitor General, Kagan filed a brief in support of Monsanto. In 2007, Monsanto was brought to court by growers of alfalfa in California—these growers alleged that their crops were being cross-pollinated with, and thus contaminated by, Monsanto’s GMO crops. After winning an initial legal victory and securing an injunction on Monsanto’s planting of its modified alfalfa, Monsanto appealed the ruling and the case eventually reached the Supreme Court. Despite the fact that the United States government had no interest in the Monsanto alfalfa case, Kagan, the solicitor general wrote an “amicus” brief in favor of Monsanto’s position. Nobody knows why the Solicitor General’s office decided to get involved in the Monsanto alfalfa case, but it was an unusual act by a supposedly neutral body; there was no rational reason for the US government to get involved in this case. While we don’t know the reason for this brief, it does make many believe that Kagan may be sympathetic to Monsanto’s corporate interests. Candidate Mitt Romney has a very long history with Monsanto and has shown a willingness to work with the agro-conglomerate if elected president. Throughout much of his business career, Romney was heavily involved with the internal operations of the Monsanto Corporation. During Romney’s private sector experience at Bain Capital, he worked for and had a significant amount of influence upon the activities of the Monsanto Corporation. 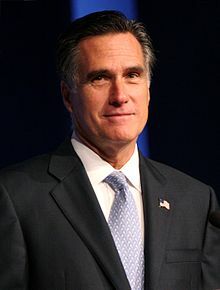 In addition to the business connection between Romney and Monsanto, several officers of the Monsanto corporation have held private relationships with Romney and have contributed to his political aspirations. In 1977, Bain Capital—the company that Romney ran, and in which he made most of his money—was starting out as a corporate consulting firm; Monsanto was among the first major clients of Bain. The multi-million dollar relationship between Bain Capital and Monsanto lasted from 1977 to 1985 and had significant effects on both corporations. Bain Capital, and its officers, made large amounts of money through its relationship with Monsanto and gained a significant client with which to base its consulting practice upon. Monsanto was given business advice by Bain and the corporation’s recent successes in GMO produce are traceable back to the suggestions that Romney made to Monsanto administrators. According to Dr. Earl Beaver, Monsanto’s Waste Director during much of the 1970s and 80s, Romney was one of the major proponents of Monsanto’s shift into the biotechnical and bioengineering industry. In response to the massive scandal surrounding Monsanto’s part in the creation of “Agent Orange” (a powerful chemical weapon that was used during the Vietnam War), Romney suggested to Monsanto Administrators that they focus on businesses that had lower levels of controversy surrounding them then the creation of chemical weapons—this shift would reduce the negative press received by the company and would help improve the public perception of the company (thus helping them make more money). The creation of bioengineered organisms was a developing industry during the late 20th century and Monsanto—partly on Romney’s advice—began to invest in their GMO production divisions as a new industry. If the officers who worked at Monsanto are to be believed, Romney had significant influence on the corporate decision-making for Monsanto and it is his advice that convinced the company’s leadership deciding to focus on GMO creation rather than simply pesticides. Romney saw a move into GMOs as a way to move away from the controversies of Agent Orange and DDT, thus improving the perception of the company. Romney suggested that Monsanto shift its industry to GMO creation, thus it is undeniable that he sees GMOs as a good investment; if he didn’t see GMO’s as a good way to make money he would never have suggested that Monsanto enter into GMO creation during his tenure as a consultant. Romney’s private sector support for GMOs will shade all of Romney’s policies in favor of GMOs and will make it very difficult to convince him to support any anti-GMO bills. Romney worked for Monsanto for years and has numerous contacts within the company. If Romney is elected, Monsanto will get unprecedented access to the president, if only due to the fact that Romney’s experience in agriculture was shaped by his work at Monsanto with Bain (his agriculture experience comes solely from Monsanto and not from working around other farming organizations). We see this access already, in the selection of several high-level Monsanto agents for advisory posts in the Romney campaign. Romney and his campaign have had significant contact with the Monsanto Corporation and have received support from Monsanto officers. While Romney has yet to hold a national office (his governorship in MA didn’t expose him to lobbying by many agri-business groups), his campaign for president has shown high levels of cooperation with the agri-business industry as well as the corn lobby. Arguably the most significant aspect of the Romney campaign’s involvement with Monsanto comes from his appointments to his “Agricultural Advisory” committee. This committee, which is tasked with advising Mitt Romney on all issues relating to agriculture and agri-business, is staffed by “experts” on the field. The experts who staff Romney’s advisory committee come directly from the agro-business industry and represent a huge level of cooperation between Romney and big agri-business. Randy Russell, a top lobbyist for Monsanto Co., has been appointed to this committee and will likely remain on if Romney wins the election. Russell’s involvement in Romney’s agricultural advisory committee represents a direct line between the Romney campaign (and thus his presidency) and the Monsanto Corporation. The simple fact that the top lobbyist for Monsanto has been given an advisory job with the Romney campaign is not unprecedented, but it does pose the worrying question: Where does the Romney agricultural policy begin and the lobbying efforts of Monsanto end? Chuck Connor – The former leader of the Corn Refiners Association; this is the largest interest group for ethanol and corn syrup producers within the United States. Bill Even – The former head of the DuPont Chemical “high-tech seed” division, which manages DuPont’s GMO seed business. Chris Policinski – The CEO of “Land O Lakes” and a party to the 2007 GMO alfalfa case in California. Tom Nassif – The leader of the Western Growers Association who has been the recipient of thousands of dollars in donations from the Monsanto Fund. Tom Johanns – A senator from Nebraska who has taken nearly $10,000 in campaign contributions from Monsanto and who advocated in favor of blocking GMO labeling during the early 2000s push by the EU to mandate disclosure. The presidential election is important, but it does not exist in a vacuum—the views of a candidates’ party are extremely important to the eventual policy that they will push for in the legislature. The modern Republican Party has become focused upon the policies of reducing corporate taxes and reducing regulations on industry. Tax cuts and deregulation of industry standards are both immensely beneficial to large corporations, such as Monsanto. While it has significant control over regulators through its revolving-door appointees, Monsanto is still vulnerable to regulations on its business. Of the two major American political parties, the Republicans promote deregulation, while the Democrats support regulatory increases (or sometimes simply retention of current regulations). If elected, it is virtually certain that Romney will sign off on his party’s platform of deregulation and tax cuts. Nothing in his history has indicated that Romney will buck his party on issues of legislation, and it appears that a Romney presidency would allow the Republican legislature to pass pro-corporate legislation without fear of veto. In the last electoral cycle, the Republicans in the legislature have taken $226,000 from Monsanto Co., while Democrats have taken only $90,500 (for a full list, sorted by candidate, follow this link). It is clear that the Republicans, as a party, are friendlier to Monsanto’s interests than the Democrats and would likely have more favorable policy outcomes if the Republicans had control over policy. When all things have been considered, it is undeniable that Monsanto has significant influence over both major parties in the United States—the only real difference between the candidates is how deep this influence goes. Regardless of whether it is Obama or Romney who becomes the next president, it appears that Monsanto will continue to have significant power in Washington politics and will retain a very high level of lobbying influence. Past this point, the article focuses on my analysis of Romney and Obama’s involvement with Monsanto and is largely opinion. Donations: While it is often difficult to unravel the massive web of political money, much of which has been filtered through SuperPACs, we know that Romney has taken significantly more money from agro-businesses than Obama. According to OpenSecrets.org, Mitt Romney has taken $4,075,531 in campaign contributions from America agribusinesses, while Barack Obama has only taken $1,377,503 from these interests. As you can see, both candidates are in bed with agribusiness corporations to some degree, but Romney has taken nearly 3X the money that Obama has from this particular industry. It is important to note that these numbers are likely far lower than the actual amounts donated because a majority of the money which is spent by SuperPACs is dark money, where there is no source disclosure. The massive disparity in agribusiness fundraising between the candidates points to the preference of these corporations that Romney get the presidency. As corporations donate money to politicians as an investment and to sway policy in their favor, it is clear that they prefer the Romney vision to the Obama vision. Partisanship: The president is important, but the legislature is where policy is made; as such, the party affiliations of the presidential candidates can be extremely determinative of the policy that will be passed. Romney is a Republican and Obama is a democrat, and the winner of the presidency will likely be able to sway the national agenda in favor of their party. In the last electoral cycle, the Republicans in the legislature have taken $226,000 from Monsanto Co., while Democrats have taken only $90,500 (for a full list, listed by candidate, follow this link). The Republican Party is based in the center of the country and the south, much of which is dependent upon farming for its primary industry—due to this dependency upon agricultural interest, the Republicans are far more politically friendly towards agribusiness than the Democrats and more likely to support companies like Monsanto. In addition to the partisan funding disparity, it bears mention that the Republican Party is unified around the ideals of lowering taxes and reducing regulations. Reducing corporate taxes and removing regulations (ex. FDA rules), benefits large corporations and their owners, thus these corporations tend to support Republicans more than Democrats. A Romney presidency will allow the Republicans to pass corporate friendly legislation without fear of veto. This streamlining of the legislative process reduces the difficulty of passing laws (and removing regulations) that benefit Monsanto, and will lead to more favorable outcomes for the corporation—It appears that Monsanto knows this, and has invested its political contributions accordingly. Regulation: Neither Obama nor Romney appears to be willing to take on agribusiness interests in order to increase regulations, but there is a key difference in their stances: Obama is largely neutral in his actions towards regulations on Monsanto, while Romney is actively invested on deregulating the industry. Appointments: Both Obama and Romney have shown their willingness to appoint corporate agents to high level advising positions within the government—Obama appointed Michael Taylor to the FDA and Romney has named several Monsanto lobbyists as his agricultural advisory board. At this point, we don’t know who would be worse in regard to appointments, but neither choice is particularly encouraging. Pingback: Глобальная война: корпоративная собственность на продовольствие и воду. — Новостинки! Pingback: GMO and the Right to Know: But What's Hidden Beneath the Label?